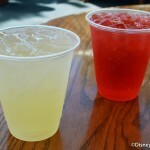 Hey there from Sunset Ranch Market in Disney’s Hollywood Studios! 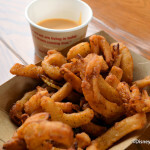 Today we are bringing you an all-new review from Fairfax Fare! In the past, Fairfax Fare focused on Barbecue classics like smoked ribs and chicken; but now, their menu consists of “Tex-mex” choices like tamales, rice bowls, and fajitas. 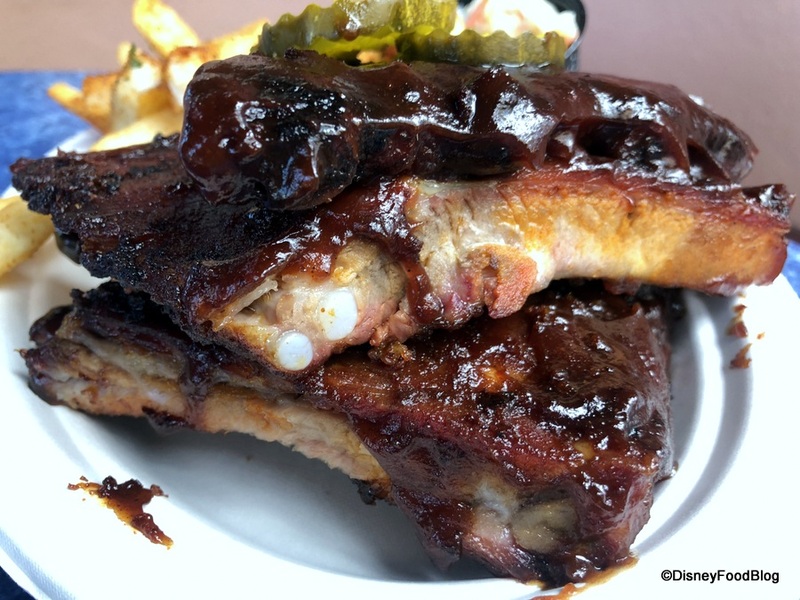 But don’t worry — if you want barbecue during your day in Hollywood, you can grab a huge plate of tasty ribs at the ABC Commissary. 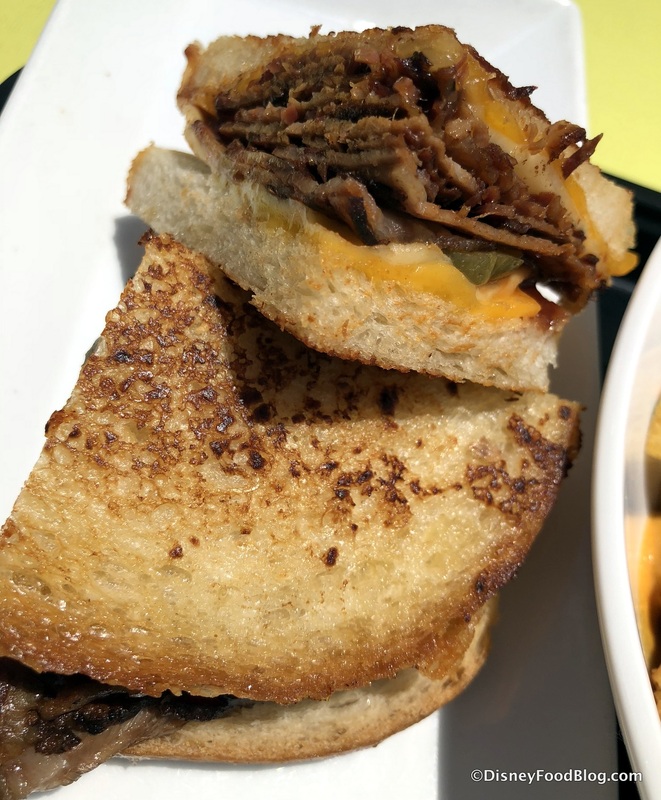 We also love the BBQ Brisket Melt from Woody’s Lunchbox in Toy Story Land! But back to the restaurant at hand! 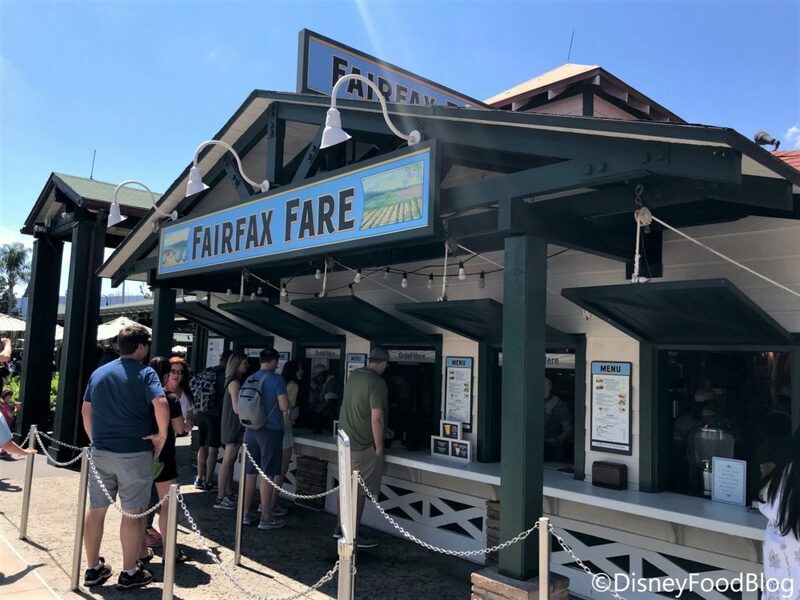 Fairfax Fare is located at the end of Sunset Boulevard, near the Tower of Terror and across from the entrance to the Hollywood Hills Amphitheater, where you can catch Fantasmic! As mentioned before, it is part of the Sunset Ranch Market — which is comprised of other walk-up locations such as Rosie’s All American Cafe and Catalina Eddie’s. These locations all share a common outdoor seating area and condiment stations. 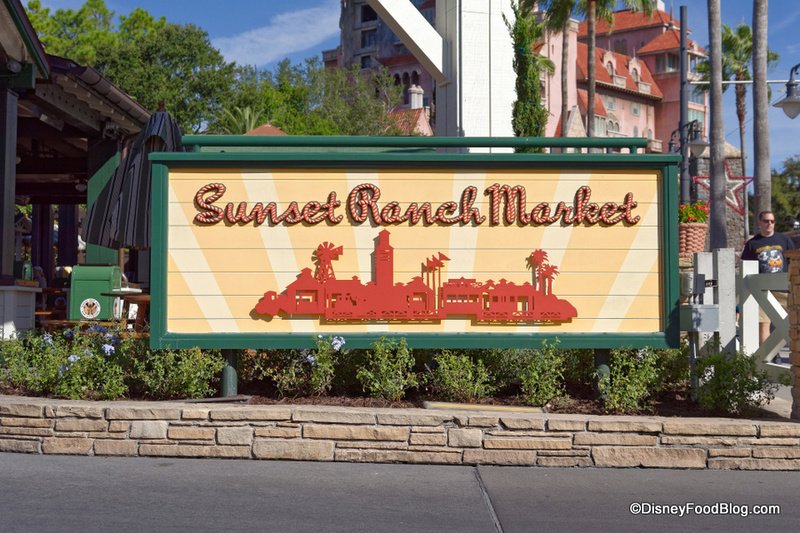 There isn’t anything fancy about the theming, or most of the food honestly, at Sunset Ranch Market, however it’s a good spot to go if you’ve got a large group who all want different things for lunch or dinner! As we said, the menu at Fairfax Fare features a variety of “Tex-mex” style entrees. Most of them are made up of the same key ingredients, but served in different fashions. 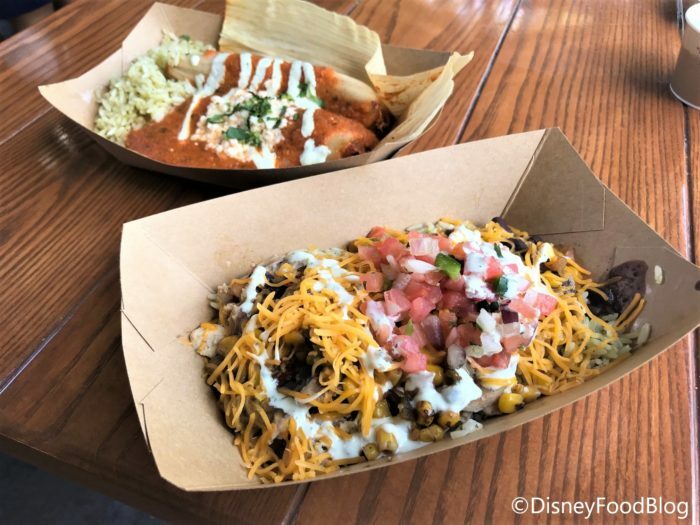 Today we decided to try the Pork Tamales and the 7-Layer Rice Bowl with Chicken. Though in the past we have LOVED the Fairfax Salad! Up first, the 7-Layer Rice Bowl. You can choose from pork or chicken — or a combo of both — for this entree. You can also add guacamole for $1, which I did because guacamole is delicious. The bowl is a hearty serving of cilantro rice and black beans, and topped with your choice of meat, a fire-roasted corn medley, pico de gallo, and sour cream and cheddar cheese. This is incredibly tasty! It may not look like a huge serving initially, but there is plenty of chicken and beans which prove to be very filling. 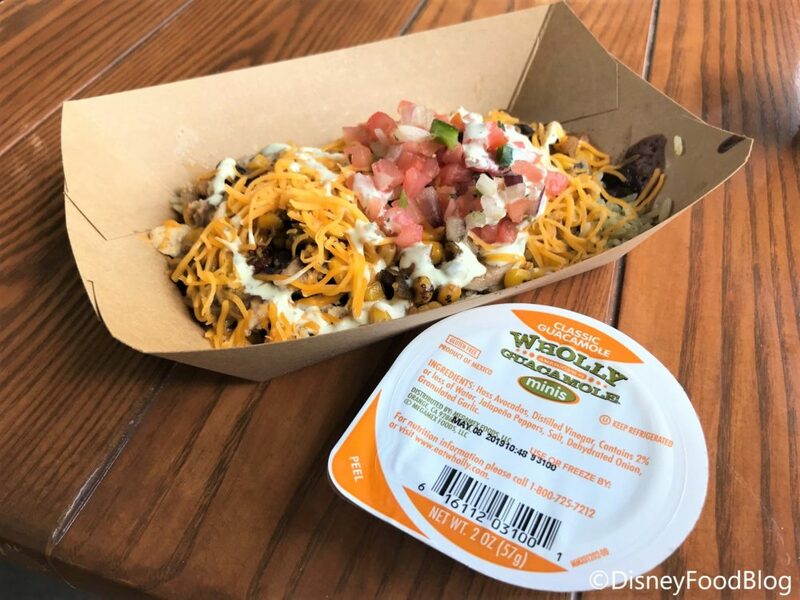 The toppings are plentiful as well, and the pico de gallo is nice and fresh. 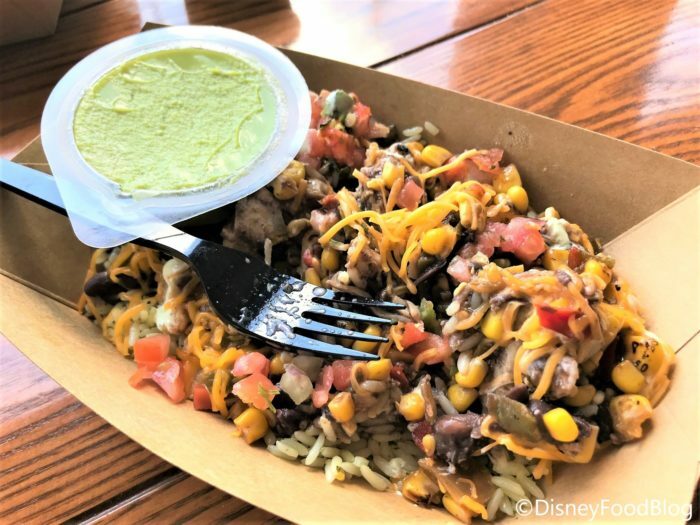 I also really loved the fire-roasted corn salsa which has a distinct grill flavor. The side of guacamole is generous as well! You get a very substantial portion for $1, which honestly, could probably be shared between two people. Unless you’re a guacamole monster like I am, in which case it’s very worth the dollar to eat it all by yourself. Next, we tried the Pork Tamales. 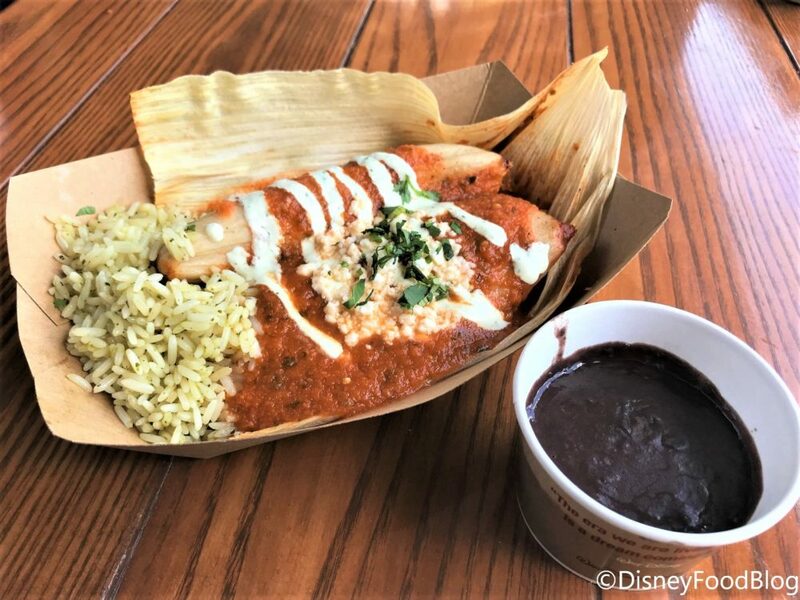 These are Pork Tamales topped with Ranchero sauce, fresh Mexican cheese, cilantro, and sour cream, and are served with cilantro rice and black beans on the side. 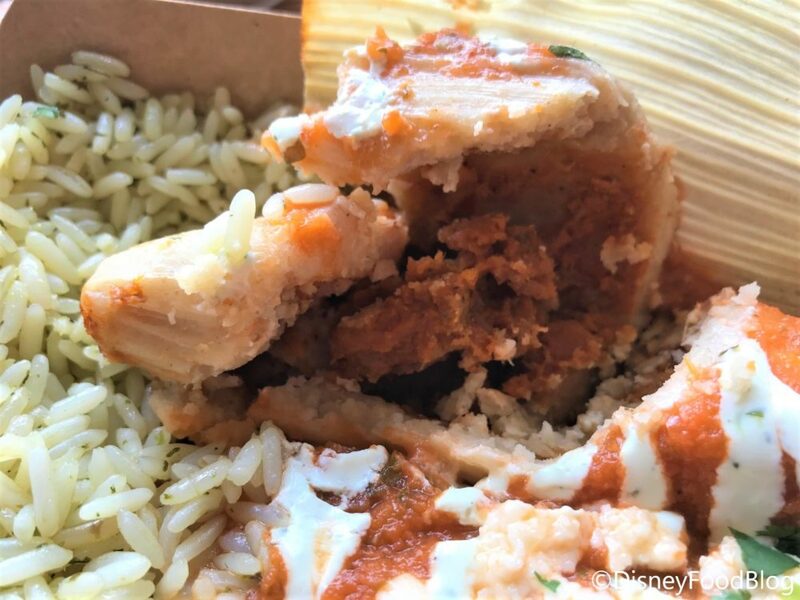 If you’re a tamale enthusiast, you know they are typically served where you have to open the corn husks yourself. 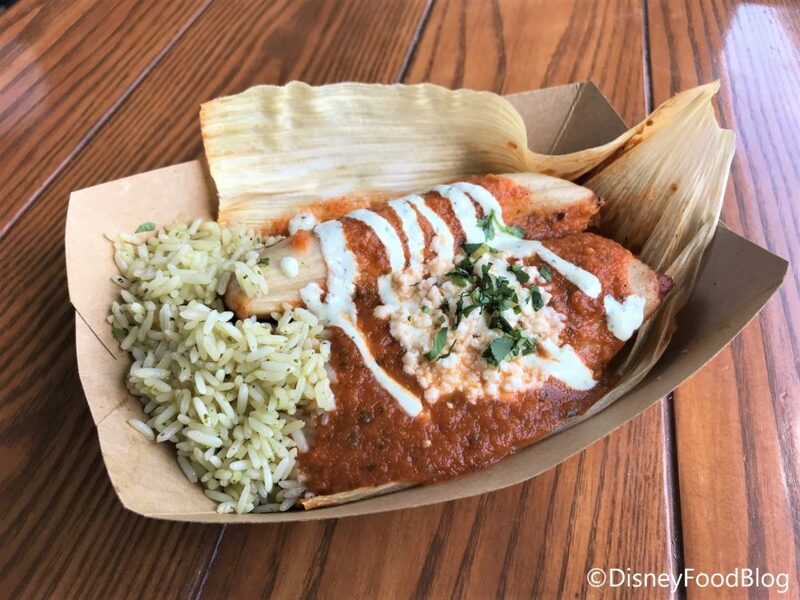 However, here Disney has taken the work out of the dish, and the tamales are served where no peeling is required. These were FANTASTIC. The tamale itself is a nice consistency, and a good balance between the pork and the cornmeal. But the real star here is the Ranchero sauce! 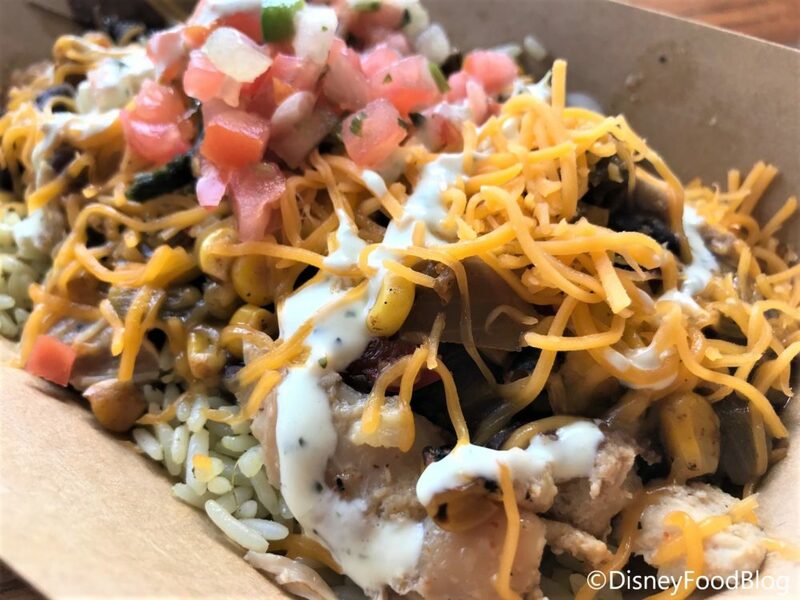 It’s got a lot of good flavor and heat — actual heat not just “Disney heat”! The spice is nicely balanced with the sour cream and generous serving of queso fresco as well. I could’ve eaten at least two servings of these — and wish I would’ve asked for extra sauce for the rice bowl. 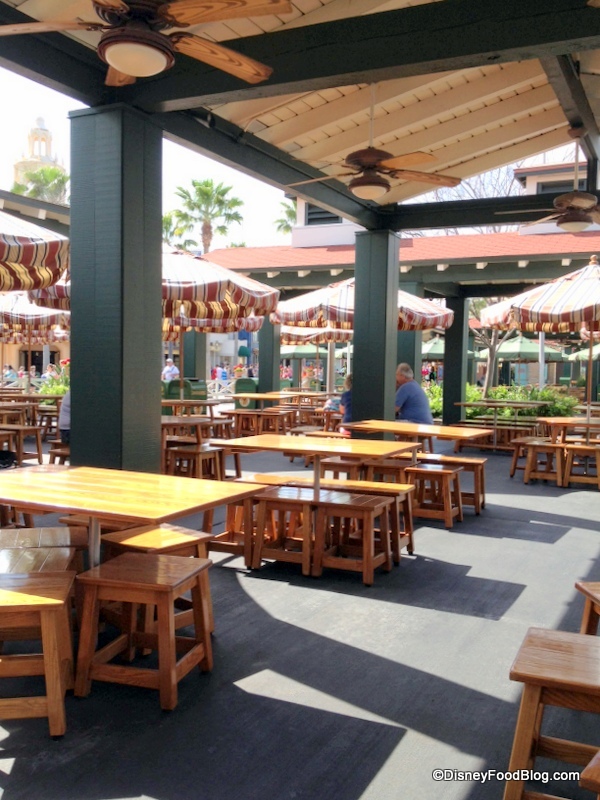 Typically the spots at Sunset Ranch Market don’t top our list in Hollywood Studios. 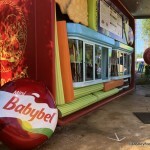 They are solid choices with a convenient location, but they don’t normally blow us away flavor wise. 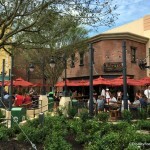 Plus, all outdoor seating is kind of THE PITS in central Florida most of the time. But, we were pleasantly surprised by Fairfax Fare! Both dishes we tried were full of flavor and very filling! They were also a tad bit lighter than the fried options at Rosie’s — so if you’re looking for something healthy-ish this is a great option. Plus, I am already excited to go back and put that Ranchero Sauce on everything. 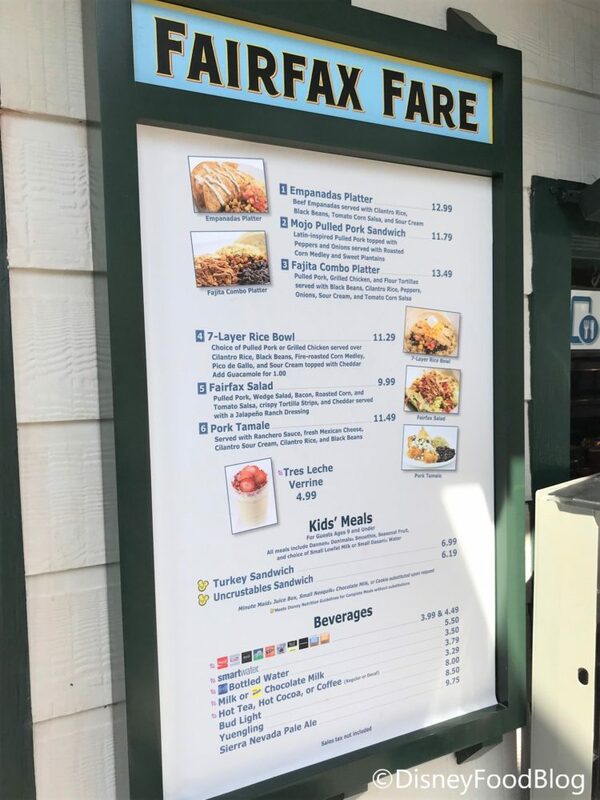 What do you enjoy on the Fairfax Fare menu? Please let us know with a comment! Review! 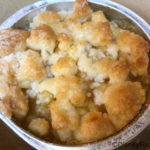 NEW Apple Cobbler at Disney’s Hollywood Studios! « Review & Photos: BoardWalk Bakery’s Newest Cupcake is a Beauty! The rice bowl sounds fantastic- except for the cilantro rice. I can’t stand cilantro! I really wish they had an alternative, because there are several items there I would try otherwise. What I want to know is when is starring rolls coming back?? That was the best sandwich joint and my fave eating place in Hollywood Studios. It was always BEYOND busy!! How does a place like this close ?? Anyone – anyone at all ?? Leticia, we never did get a solid reason from Disney about why Starring Rolls closed, but there have not been any plans (that we know of) to reopen it. Sarah, yeah, it looks like the only rice on the menu is cilantro rice (I was checking to see if you could sub for plain). It’s possible they do have plain rice on hand for that purpose, but we don’t know for sure. 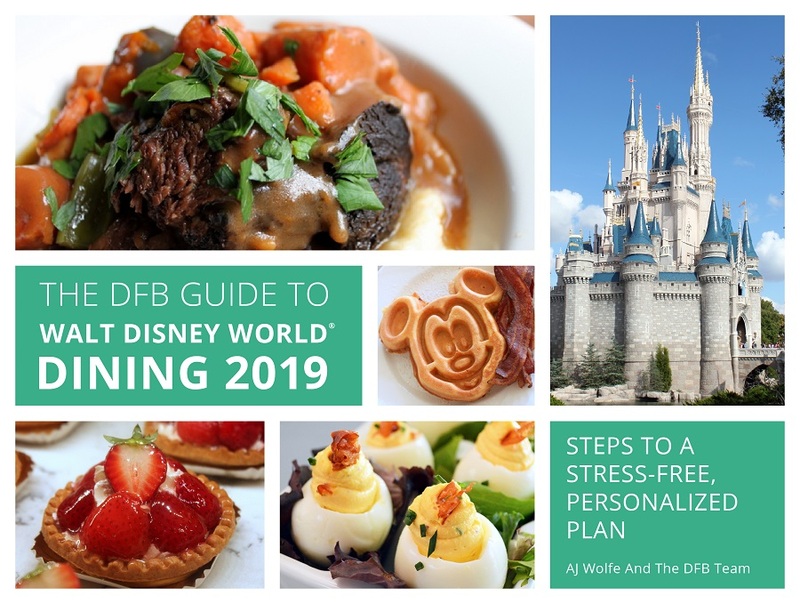 You can try calling Disney to ask, or you can check when you’re in the area. Sorry I couldn’t be more helpful! Are any of these offerings Gluten Free? Are any of these Tex Mex offerings Gluten Free? Food sounds delicious! Two issues. 1. They couldn’t make a kids version of any of that? 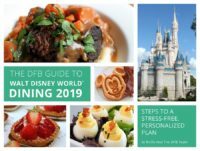 Kids only get turkey or PB sandwiches? 2. All that Tex Mex food and no margaritas? Needs a better drink option, especially since it’s included on the DP. Mark, none are specifically noted on the menu, and unfortunately they don’t have an allergens menu online. Typically we would expect them to have GF options, but we don’t know any specifics. If we find out, I’ll update!